Cannondale’s 2018 Quick CX 4 Hybrid Bike features a SmartForm C2 Alloy frame, SAVE technology, and a balance of upright and forward-leaning geometry that’s comfortable for commuting yet zippy on dirt and gravel. Frame Material: SmartForm C2 Alloy, SAVE, 1-1/2" to 1-1/8" tapered head tube. Fork: SR Suntour NEX w/ lockout, 50mm, 1-1/8" steerer. Headset: VP Si, 1-1/8" tapered reducer. Bottom Bracket: KMC Z51, 8-speed. Cassette: Sunrace CSM558, 11-32, 8-speed. 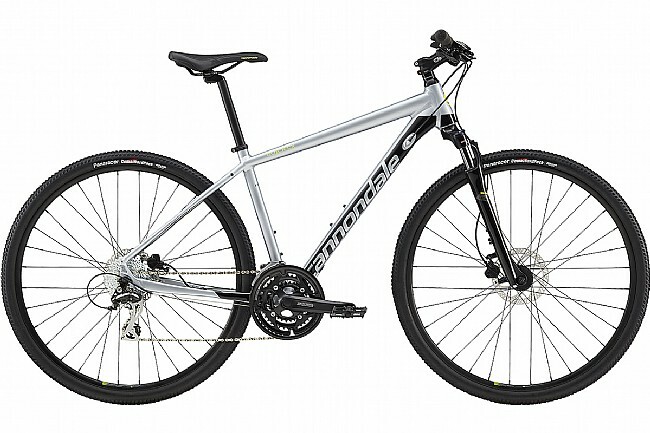 Handlebar: Cannondale C3, 6061 double-butted, 12mm rise, 680mm. Stem: Cannondale C3, 6061 alloy, 31.8. Saddle: Cannondale Quick CX Ergo. Seatpost: Cannondale C3, 6061 Alloy, 27.2x350mm. Rims: DC 3.0, double wall w/eyelet, 32-hole. Tires: Panaracer Comet Hardpack, 700x38c. Manufacturer Warranty: Limited lifetime for frame; limited 1-year for components..